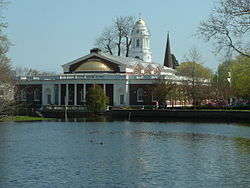 A Public Hearing of the Board of Aldermen will be held on Monday, August 5, 2013 at 7:00 P.M. in the Auditorium, City Hall, 110 River Street, Milford, Connecticut. – Consideration of sale under CGS 8-24. – Consideration of conveyance to the Borough of Woodmont under CGS 8-24. 2. Statements limited to the legislative function of the Board of Aldermen. The time limit granted to each speaker shall be three (3) minutes. Residents, taxpayers or electors may address the Board. (6a) I am pleased to inform the Board of Aldermen that the City of Milford has, once again, been awarded the Certificate of Achievement for Excellence in Financial Reporting by the Government Finance Officers Association (GFOA). The Certificate of Achievement is the highest form of recognition, and its attainment represents a significant accomplishment by a government and its management. Congratulations to Finance Director Peter Erodici, Jr., and all the dedicated members of the Finance Department for this outstanding achievement. (8d) Board of Aldermen approval is requested for the attached Resolution Re: Master Municipal Agreement for Construction Projects between the State of Connecticut, Department of Transportation and the City of Milford, and to authorize the Mayor to take all steps necessary, including signing all documents, to effectuate this Agreement. (8e) Board of Aldermen approval is requested per the attached recommendation of the Planning & Zoning Board dated July 17, 2013, for the sale of 204 Melba Street by public auction with a minimum bid of $476,380.00. Said sale shall be subject to an easement in favor of the City of Milford for the purpose of locating, accessing and maintaining a communications tower on the property. (8f) Board of Aldermen approval is requested per the attached recommendation of the Planning & Zoning Board dated July 17, 2013, for the conveyance of 128 Kings Highway, formerly Fire Station #5, to the Borough of Woodmont for the consideration of $1.00 with the condition that the Borough of Woodmont shall be the sole owner of 128 Kings Highway and shall use said property solely as the Borough Hall for the purpose of conducting the Borough’s business as a municipality, except the Borough shall allow the property to be used by the City of Milford as a center for community meetings. If at any time the Borough of Woodmont discontinues or abandons the use of the property as the Borough Hall, ownership of 128 Kings Highway shall revert back to the City of Milford.